Nagaland, the land of the hospitable and warm Nagas, lies in the corner of India’s North-East-bordering Myanmar. It has always evoked a sense of awe and wonder in the minds of people including the visitors. 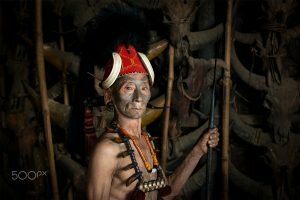 Although most of the Nagas have now become Christians, they still preserve the remnants of their early animist culture and ancient traditions. Historically, the Nagas have always been brave warriors. They consider the safety and security of their guests as an honor and prestige and will never allow any harm to be done to any of their guests/visitors. Topographically, Nagaland is mostly a hilly region with a pleasant and salubrious climate throughout the year, except for a small region in the foothills. Colourful life and culture are an integral part of the 16 officially recognized Naga tribes of Nagaland. These 16 tribes are different and unique in their customs and traditions. These customs and traditions are further translated into festivals which revolve around their agricultural cycle. Songs and dances form the soul of these festivals through which their oral history has been passed down the generations. Nature has been kind to the Nagas and their land. Though by virtue of her natural beauty, the whole of Nagaland is a tourist hotspot, yet certain exceptionally charming places have been identified and developed by the Government to promote tourism in the state, some of which are highlighted in the website. This focused approach helps in providing easy access to travelers of all categories-tourists, researchers, backpackers, ecologists etc. Since this little explored state is still developing and many more places remain ‘un-marked’-making them even more exclusive and fascinating to explore.